Australia has over-invested in electricity generation and distribution infrastructure. It has not invested adequately in building strategic reserves of transport fuels. THE cost of Australia's new fleet of submarines could blow out to $150 billion after the defence white paper confirmed the price tag. Dear @TheIPA, Oil companies prefer Singapore refineries. Aus taxpayers kick in $150 billion for submarines to secure fuel supply. Discuss. "One version of electric vehicles might use a battery for short trips and activate a hydrogen fuel cell on longer trips after the battery charge is depleted." A plan for transitioning the economy to zero reliance on fossil fuels could take advantage of the first of these issues and overcome the second issue at the same time. The plan would increase the use of electricity generation and distribution that is presently not being effectively used for the benefit of the economy and reduce the reliance on transport fuels for which there are inadequate strategic reserves. The transition from leaded to unleaded transport fuels begun in 1981 with a target end-date of 2002 is a good example of how the adoption of a long-term policy simplifies the making of investment decisions of stakeholders for new plant and equipment. Vehicle manufacturers at present face considerable uncertainty in predicting which of the emerging clean fuel transport systems will win out in the long run. Adopting a policy for the introduction of electric vehicles would reduce that uncertainy. Allowance can still be made for competing technologies that are quickly evolving. Fuel cells for instance that produce electric power from, say, hydrogen, are not that dissimilar from batteries that store and recharge electrolyte in situ. Vehicles using either, or both, of these energy supply systems would be powered by electric motors regardless of which these two evolving technologies provides the electricity. One version of electric vehicles might use a battery for short trips and activate a hydrogen fuel cell on longer trips after the battery charge is depleted. Both renewable and fossil fuel investments for generating and distributing electricity can be utilised at close to full capacity to provide electricity for recharging electric battery powered vehicles. 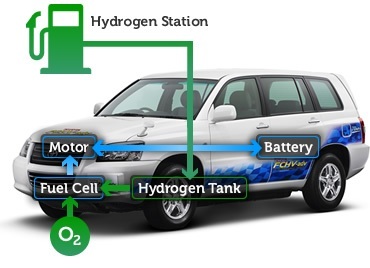 Both of these investments can also be used to manufacture hydrogen for fuel-cell powered electric vehicles. This plan would encourage continuing expansion and technological advances in renewable energy without the need to immediately write off substantial capital invested in fossil fuel power plants. It would give this existing investment (or excess investment) in fossil fuel plants both an extended life and a definite expiry date. Rather than keeping them running at partial capacity to supply a diminishing share of fixed energy needs, they could begin to take over demand for transport fuels. The expiry date for these power plants would be extended to the date by which ongoing investments in renewable energy are planned to take over 100 percent of both fixed energy and transport energy needs of the Australian economy. The Australian Government's 2016 defence white paper reveals the economic impact of relying on imported transport fuel. "Good Morning Minister for Defence, Senator the Honourable David Johnston, Mr Stephen Loosley, Mr Peter Jennings, Former Chiefs of Navy, Ladies and Gentlemen. I’m delighted to be able to speak to you about submarines in Australia’s maritime strategy. My intention today is to provide as objective a view as possible of the strategic rationale for submarines in Australia’s defence forces. More than anyone else, I understand it’s about much more than the platform but I do want to focus on the role of the platform because, let’s not kid ourselves, along with the people, the platform is the key component in the capability. The recent NRMA Study on Australia’s liquid fuel security is for me a significant case in point. Who here is really comfortable that a serious interruption to our liquid fuel supplies to this country would, within a month, have significant impacts on our economy and society? That is why Navy’s contribution to the effective operation of the maritime global trading system is so important. Those contributions are needed around the system, not just in a tight set of concentric rings drawn around Darwin. These contributions are more sophisticated than traditional notions of SLOC protection and that is something we need to explore. So, as we discuss the role of submarines in our national maritime strategy, it’s important to keep in mind the stakes we are considering." From a paper by Troy Whitford, Fuel Mandates have a History of Success and a Lesson for Bio Fuels Implementation. Australian Policy and History, April 2010. "In 1981, Australian state and federal transport ministers met to address pollution problems. Driving the shift towards unleaded petrol were vast environmental and health concerns. During the 1980s, automobile associations were critical of the introduction of unleaded fuel. The RACV opposed the implementation believing it was too costly. The oil industry was cynical, too, arguing the introduction of unleaded fuel did not follow from a technological breakthrough but rather a decision by ministers. Without doubt, the position taken by oil companies, automobile associations and other stakeholders regarding unleaded fuel changed over time. Despite opposition to unleaded fuel, the Transportation Council adopted a program to mandate unleaded petrol by 1985. The implementation policy for unleaded fuel was undertaken in stages. Initially, regulations were made calling for all new motor vehicles made after January 1986 (manufactured within Australia or imported) to meet the new fuel requirements. The policy then called for a complete phase out of unleaded fuel by 2002. Prior to the national mandate, states had led the way on unleaded fuel of which NSW took the lead. The decision to mandate was essential for implementing unleaded fuel. It forced car manufacturers, oil producers and consumers to make the transition."